موحد, ضیاء. (1387). A Critical Examination of Ibn-Sina’s Theory of the Conditional Syllogism. دوفصلنامه جاویدان خرد, 05(09), 5-20. ضیاء موحد. "A Critical Examination of Ibn-Sina’s Theory of the Conditional Syllogism". دوفصلنامه جاویدان خرد, 05, 09, 1387, 5-20. موحد, ضیاء. (1387). 'A Critical Examination of Ibn-Sina’s Theory of the Conditional Syllogism', دوفصلنامه جاویدان خرد, 05(09), pp. 5-20. موحد, ضیاء. A Critical Examination of Ibn-Sina’s Theory of the Conditional Syllogism. 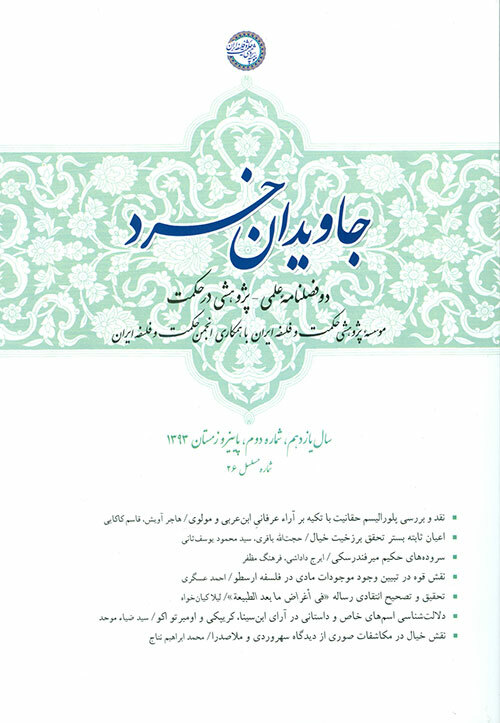 دوفصلنامه جاویدان خرد, 1387; 05(09): 5-20. This paper will examine Ibn Sina’s theory of the Conditional Syllogism from a purely logical point of view, and will lay bare the principles he adopted for founding his theory, and the reason why the newly introduced part of his logic remained undeveloped and eventually was removed from the texts of logic in the later Islamic tradition. As a preliminary discussion, this paper briefly examines Ibn Sina's methodology and gives a short summary of the relevant principles of Aristotelian logic, before delving into the analysis of Ibn Sina's treatment of the conditional, which is the heart of the paper. This analysis explains Ibn Sina's theory of conditionals in systematic stages, explaining his motivation at each step and showing the weaknesses in his argument using the tools of modern symbolic logic. The paper concludes by mentioning a few of Ibn Sina's remarkable insights regarding conditionals. Key terms: Conditional Syllogism, Ibn Sina, Aristotelian Logic.